This CD presents the violin and piano sonatas of Aaron Copland, Douglas Lilburn and Ralph Vaughan-Williams, composed in the years 1942-43, 1950 and 1954 respectively. 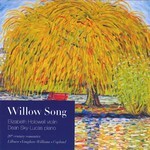 Viewed as a triptych, and in recognition and celebration of Lilburn's 100th year anniversary in 2016, the association of the sonatas of Vaughan Williams and Copland recognise Lilburn's appreciation of his teacher Vaughan Williams and mentor Copland. While all three works are titled 'Sonata', the departure from the Classical reference is immediately noticeable. Each Sonata uses the motivation of metamorphosis, motivic development and cyclical return, in each instance finishing the work with the restatement of opening figures - these being echoed in the refraction of unanswerable and imponderable questions and accusations in the preceding movements. Another commonality in the Sonatas is a powerful sense of argument. Piano and violin engage in terse and uncompromising musical debate which sees all three works conclude with an ambiguous sense of harmonic finality or stability - quite the opposite intention of the 18th century coinage of the term "Sonata". The works are epic in scale. They are sonic sculptures reminiscent of their respective, national landscapes where antediluvian, colossal forces bent, twisted and recycled igneous and sedimentary rock into the vistas of America's mesas, New Zealand's Southern Alps and the natural formations of the UK's Fingal's Cave, Orkney and Shetland Islands.